After having my first reviewer point out my spelling and grammar errors in A Dash of Murder I am pleased to announce a corrected version has been uploaded to Ama zon and Smashwords. The Amazon edition is available now and the Smashwords edition which will be in Barnes and Noble, I Tunes, Sony Reader and other formats will take up to two weeks. One of the questions my reviewer wondered was whether there will be more books in the Pecan Bayou Series. Yes!! I have been working on one book that seems to keep centering around….blueberries. A definite work in progress kind of thing! I am going to participate in National Novel Writing Month this year. If you are unfamiliar with this event, it is a worldwide write together where authors try to complete a 50,000 word novel from start to finish during the month of November. One of the rules is you have to start with a zero word count and “blueberries” is almost at it’s halfway mark. 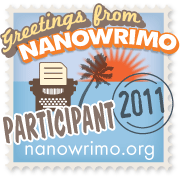 This means I am busily outlining, plotting and researching for the NaNoWriMo book right now. I’m not sure if I will actually achieve this goal with kids home on Thanksgiving vacation, but it is worth trying! It works out to 1667 words a day of writing and when I’m working I probably average 500 to 1000. I read one article written by a past participant that advised cooking casseroles and freezing them for my family all month. Happy Thanksgiving kids–more Hamburger Helper? It’s Cheesy Mac!! !